So you’ve bought a property. That’s fantastic! Now, what happens? The real estate agent will give you a Contract of Sale to read and sign. If you have signed a Contract, let’s get started. 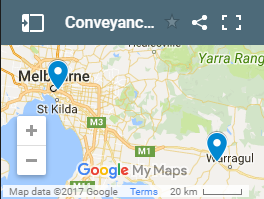 Upload your Contract here, and one of our specialists in property conveyancing Melbourne and regional Victoria will get back to you soon. But if you haven’t signed your Contract and don’t understand the legal jargon? That’s OK; we can still get started, just upload your proposed Contract here. We will read your Contract at no cost and advise you of its contents in a more understandable way. You can then go ahead feeling confident in signing your Contract, and we can begin the property transaction process immediately. conveyancing.today can do this for you for free. Just stop by our office with 100 points of identification. Otherwise, you can go into any Australia Post outlet with the form below and your 100 points of identification, and they will complete it for us for $39.00.